...of books, I mean. Although it's so cold and windy here, I'm sorely tempted to crawl back under my coziest blanket and stay there for the day. Oh spring, whither for art thou? Although I didn't plan it, I'm in the midst of a book about mothers and daughters. The book is One True Thing, Anna Quindlen's 1994 novel that describes the multi-faceted relationship between 24 year old Ellen Gulden and her mother, Kate. When Kate is diagnosed with advanced cancer, Ellen's father insists that she quit her job and come home to care for her mother, the quintessential homemaker and family touchstone -their "one true thing." But Ellen has always placed herself akin with her father in the family dynamic - the intellectual, high achiever. Initially, she is resentful and afraid - she has no idea how to play the role of caregiver, the one her mother has always embraced so masterfully. Yet as the days and weeks pass Ellen changes, and reassesses her preconceptions about her mother, her parent's marriage, and the choices she has made for her own life. Because I'm a huge fan of Quindlen's work - both her fiction, her memoir, and her journalism - I know there are autobiographical elements to this novel. I know that her own mother died from ovarian cancer, know that Quindlen's father called her home from college to care for her mother during her final illness. But knowing Quindlen has woven bits and pieces of her own experience into the fabric of this story just makes the novel all the more interesting and touching. The mother-daughter relationship in One True Thing is so poignant, and I love watching the subtle ways that Kate uses this final opportunity to teach Ellen some things about valuing herself as a woman. I started thinking about some of my of favorite contemporary novels that deal with the mother-daughter relationship. Mary Gordon's Men and Angels came to mind immediately. I first read it back in the early 80's, but I re-read it about every five years because it's so powerful and affecting to me. It explores that age-old question - how does a mother satisfy her own need to be creative and productive, to have her own life, while still providing the best care for her children? Another favorite is Amy Tan's novel The Joy Luck Club, which looks at the way a mother's cultural history affects her expectations for her daughters. I've always loved this novel (and the movie adaptation), and when it was first published most of us in the western hemisphere knew very little about Chinese culture. It was intriguing to look at the mother-daughter dynamic through the eyes of eastern history and culture. How about you? 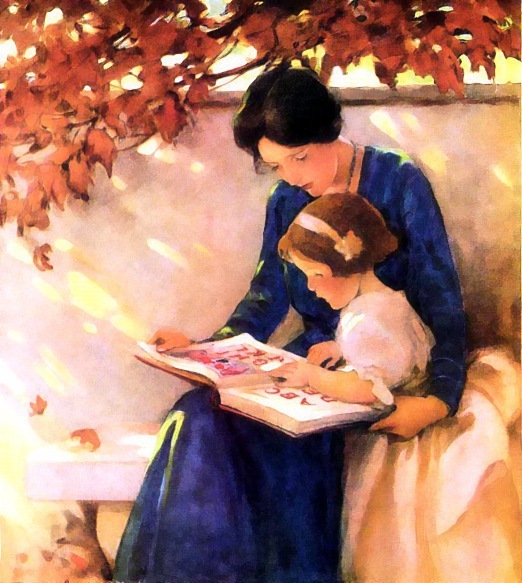 Do you have a favorite novel or memoir about motherhood? If you're interested in reading further - a bibliography of Mother-Daughter Relationships in Contemporary Fiction from the University of Delaware.